I'm married to a man who loves PB&J sandwiches and has me make him one just about every single day for work. But that's okay because, if you ask me, peanut butter is pretty much manna from heaven. My Australian friends were grossed out. Vegemite and Cheese? Yup. Egg and Mayonnaise? Yup. Ham and Mustard? Yup. But peanut butter?! You didn't mix anything with peanut butter - let alone jam. But I kept to my new flavour combinations - peanut butter and jelly (jam) and cream cheese and jam and went along my merry way. Once I married an American, PB&J obviously became the norm - so naturally, I wanted to make a little bit of a grown up twist on the ol' PB&J sandwich. 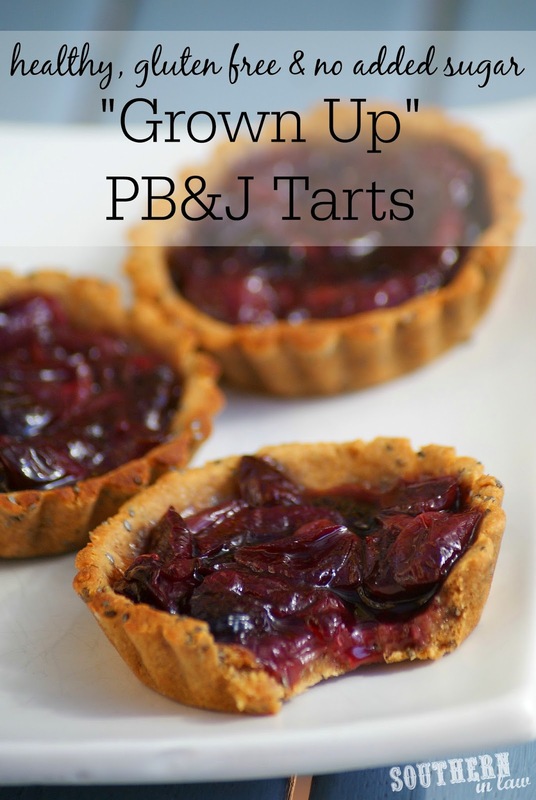 I had way too many grapes thanks to an impulse buy at the supermarket and knew what I had to make - Healthy Peanut Butter and Jelly Tarts! What I came up with a recipe that was gluten free, completely free of added sugars, low in fat and absolutely delicious! Mix together all of your ingredients until combined - it will feel like a firm dough. If your dough is too crumbly, add some water or milk in a teaspoon at a time until it reaches the right consistency. Divide your dough into eight portions and press into your tins, spreading to cover all of the edges. Bake for 8-10 minutes or until slightly cooked and puffy. Place your washed grapes in a medium saucepan with your water. Cook over a medium-low heat until your grapes have cooked down and the mixture is thickened. You will have some thicker liquid with your cooked grapes. Stir in your vanilla extract and salt. Pour your grape mixture into your cooled tart shells and place back in the oven for 5-8 minutes or until golden. 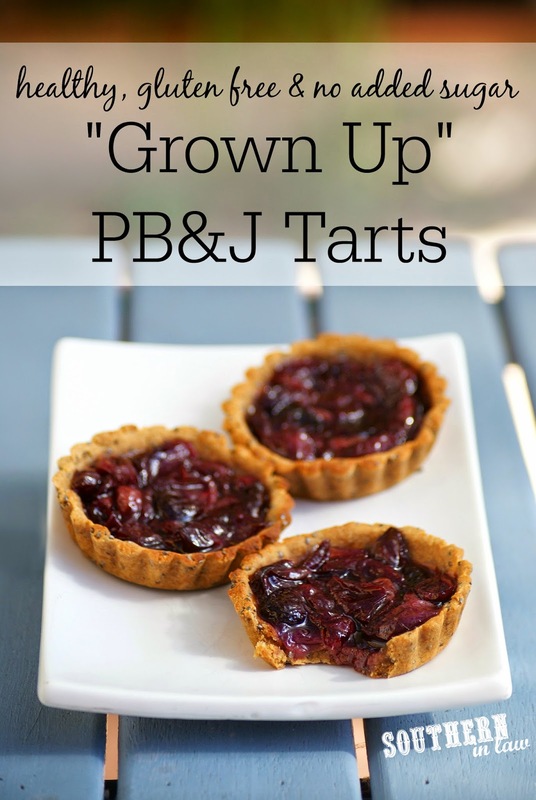 These tarts will keep for 1-3 days in an airtight container but are best eaten fresh. We liked them chilled or at room temperature but you can eat them however you like! But tell me, what was your favourite sandwich as a kid? And what "kid food" do you still love? When I was a kid, my favourite sandwich was Vegemite, Cheese, Lettuce and Tomato on grainy bread. It was one of the few sandwiches I'd actually eat - but never at school because I hated soggy sandwiches! (I was the weird kid that brought plain wholegrain bread rolls or chose crackers over sandwiches). YUM!! That's so funny that you were the weirdo who liked PB&J. Most people like it I'd think. Those are so cute! And I loved how you used peanut flour in this!